Everitt Design, Winnipeg, Canada - Project Complete! Often we designers are so busy creating wonderful spaces for our clients that we fail to give our own spaces some love. This was the case for our office bathroom in Winnipeg. There had been a few small improvements/maintenance over the years but the overall space was looking tired and forlorn. Not only did the space need new life, there were also a few pet peeves that needed addressing. One of those pet peeves were the inevitable water spots and finger prints on the flat faucet lever - first world problems, we know!! In order to prevent this in the new space, a hands-free faucet was a priority. The search for the perfect fixtures and finishes was on. 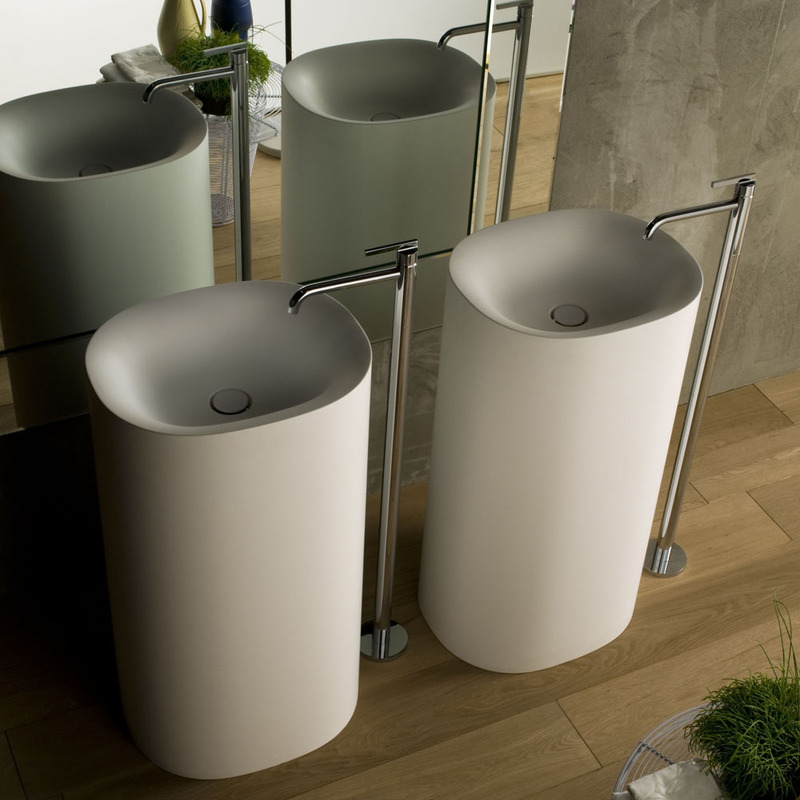 At one point we came across a stunning freestanding washbasin from Boffi. Unfortunately, the price tag was also stunning and so the search continued. Countless faucets, sinks and mirrors were considered and then discarded for not quite meeting our design criteria. Finally, a hands free wall mount faucet from Dornbracht and a Blu-Stone solid surface free standing washbasin were selected. The existing powder room never had a properly installed mirror as the window behind the sink made things a little tricky. Also, with the dark colour scheme we had in mind, we wanted to increase light levels. Solution: source a suspended mirror with LED lighting. Most of the mirrors we found had a very cool colour temperature but finally we succeeded in sourcing a 3000K lit mirror from Duravit. Of course, it did not come with the option to suspend, so a custom stainless steel bracket was designed to run power to the mirror and suspend from the ceiling without blocking too much of the window. We did definitely challenge our contractor and trades with some of the products and design, but they were on top of it and resolved the challenges before they became an issue. As with any renovation, there were unexpected delays and some days if felt like it would never be complete. However, we need to be reminded of what our clients go through every once in a while, even if it is only on a small scale. Overall, we are very pleased with the results and the process. The only problem is that now the rest of the office needs sprucing up! Our next project will be to replace the flooring (this will be quite the task with the volume of samples and shelving, anyone want to help!?!?!?) and fresh paint. Check back in spring/summer for updates! Why travel away when you can escape to this beautiful spot right here in West Hawk Lake, Manitoba! Just a few final finishing touches remain to complete this stunning cottage. We are Winnipeg's Ciao Magazine's 2018 Grand Prize Winner! Yes, indeed our kitchen project won 1st place in this year’s Ciao Magazine’s 2018 Best Winnipeg Kitchen!!! It is always exciting to see our clients rewarded as they won a 6-course dinner for 8, prepared by an award-winning chef in their very own kitchen. The Modern Man Barbershop in Garden City Mall in Winnipeg still needs a few final details to be complete, but is open for business and looks great! The space features refined metal and brick details and an open ceiling to allude to an industrial space while maintaining clean lines. The open ceiling with tall mirrors and extended height vertical frames also allows 10 cutting stations, a lunch counter, reception, display and storage to all fit into a footprint less than 600 sq ft while remaining spacious. Why not take a trip to the northwest end of the city and see it for yourself! This has been a week of tile and we would like to share a few of the highlights. First up is the beautiful glass tile from C&S distributors. It consists of 2 layers of glass with either fabric or textures between the layers. The result? Breathtakingly beautiful! Most of these beauties are available in a wide range of sizes from 4"x4" tile all the way up to 48"x110" slabs! Imagine a walk in shower or a feature wall in a powder room finished with one of these. Sicis, Vetrite Glass Tile & Slabs distributed by C&S. Second, Ames Tile had a lovely event to highlight a few new lines and share product information. Are pentagons the the Hexagons? Hexagons have been huge lately but are pentagons swooping in to take over? If this cute little guy is any indication, I would have to say yes. In reality, the "texture" is just the pattern cleverly designed to mimic several fabric textures, the tile itself is smooth. This is just one of the many reasons why we order physical samples. This next tile actually is quite textured and comes in various formats including exterior patio blocks. There are so many more absolutely stunning options out there with new sizes and formats coming out constantly but this concludes the tile highlights of this week. An extensive renovation is underway at a client's gorgeous Mid Century Modern home in Winnipeg, Canada. This photo features the new raised clerestory ceiling in the dining room. The added light and treetop views change the home completely! More photos to come. Progress shot in raising the dining room ceiling and adding clerestory windows. Realtor photo of dining room before purchasing the house and starting renovations. We are excited to see our new home design starting to take shape on Park Blvd. in Winnipeg, Canada! It has been great working with this client to make their dream home reality and we look forward to working with them right down to the final details. Lake St. Martin Community Moving Home at last!! The First Nations Community of Lake St. Martin will finally be able to move home 6 years after being flooded and displaced to save Winnipeg. We were thrilled to have the opportunity to work with Matix Lumber in designing new homes for this community and excited to see the first completed house roll out yesterday. We have received some exciting news today! Everitt Design was featured as one of the Top Interior Design Companies in Winnipeg on Point2 Homes - one of the top 5 real estate portals in Canada. This acknowledgement shows that we’re accomplishing our goal – to turn houses into deeply cherished homes. To read the entire article please visit Point2 Homes Blog. A typical office space with long corridors and tall cubicles was in desperate need of refreshing. A spectacular Ensuite renovation for a repeat client. Panoramic view of Agora Fine Foods and Bistro & Wine Bar nearing completion. Doesn’t this sound too good to be true? Well, it will be opening soon so let me give you a hint of what Agora Fine Food Market and Indulge Bistro & Wine Bar is all about! Toss cushions designed by Jessica Zoob for Black Edition. Available thru Everitt Design. The first day of fall, Crisp mornings and nights and leaves changing colour tell us that it wont be long before the winter winds start howling. Ok, I know this sounds depressing, but it really doesn't need to be. Blustery shivering nights can be cozy and wonderful with the proper accessories. One "must have" for the coming weather are toss cushions. The right toss cushions beg for you to snuggle up with a good book and hot cup of cocoa and help to make the experience so much more enjoyable. Why, I think I can hardly wait to do just that as I am writing this! What inspired this post you may ask? Well, we just received a beautifully packaged box and what did we find inside? Two stunning toss cushions that we had ordered for a client, designed by Jessica Zoob for Black Editions. These 20"x 20" feather filled beauties can also be yours for only $150 + taxes. There are a few different lines with various aesthetics offered by this company. Click on the images below to check out the options! As designers, we get invited to numerous events showcasing various products. This can be a great way to form new connections, learn more about products or services and try out product. Sometimes, tho, we need a little extra incentive to take the time and make the effort to drive out to wherever the event is taking place. Last night, it was the venue that sold us. Anthony Allan Work Environments was holding an event at the new Journey to Churchill exhibit and as we hadn't yet visited it, we decided this was one event we could not afford to miss. We were not disappointed. Not only was the layout conducive to exploring and discovering various new and beautiful chairs placed throughout, it also helped reduce echoing claustrophobia. To top it all off, the polar bears were strutting their stuff and swimming about and the seals were doing laps. This is a fantastic little guest chair! It is comfortable, the back is flexible and it can very easily be moved about the office to wherever it might be needed. Fern Task Chair, designed by Haworth & Ito Design. Distributed by Anthony Allan. This is a sleek design using a spine like structure and mesh to create a back with no pressure points. The back flexes side to side along with your movements for added comfort and an increased range of motion. I know I am a child, but I just couldn't resist! One of our most exciting projects is on a mountain high above Kelowna BC. Recently completed, this unique 6,500 square foot home was designed and detailed completely by Everitt Design. Professional photos of this project will be coming soon, but here is a sneak peak at a chiropractic office recently completed. Project by Everitt Design featured in the Shaw Hospitality Look Book 2016! New Boutique Hair Studio on the main floor of the Everitt Design office building.